I thought i would compile a blog post of Magazines and the freebies they are giving out currently or are due to be giving out in the next month or so. As you already probably know, this months In Style magazine, that is out now, is giving away a full size Nails Inc nail polish in this months mag. 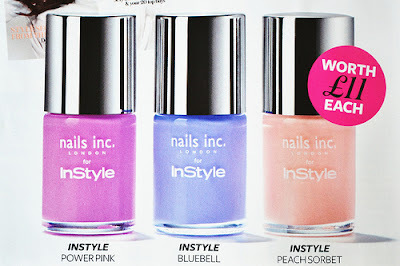 The magazine costs £3.80 and comes with a choice of three shades, power pink, bluebell and peach sorbet. The peach shade is my personal favourite and i actually tracked this down and snapped it up today! Worth £11 a bottle. Next months In Style will contain one of two The Body Shop goodies either a mascara or two eyeliners! 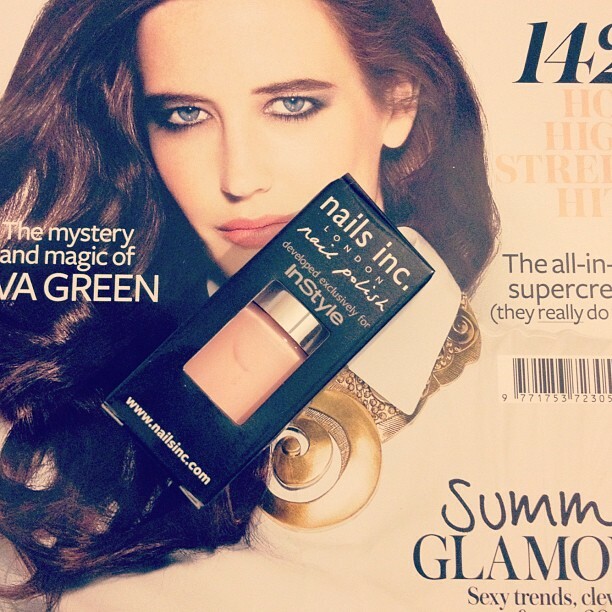 The July edition of glamour Magazine, due out on the 31st May has three free mini Benefit products to choose from. Mini That Gal Primer (Worth £15), mini Porefessional (Worth £10) and mini Bad Gal Lash (Worth £10). Definitely worth picking up! I know for sure that i will be tracking down a couple of each, Bad Gal lash is one of my faves and ive wanted to try porefessional forever! Glamour costs £2. The April/May copy of Wedding magazine has a voucher for a free New CID i-glow shimmer compact that is worth a whopping £22.50. All you have to do is send the voucher off to them. I think i will have to get this for myself as i love the New CIF i-glow in coral crush that i blogged about here. The June edition of Marie Claire magazine that is out now is offering a free The Body Shop Lip and Cheek tint, available in two shades. It also has a code for 25% off Kurt Geiger so a good deal all around! The magazine will set you back £3.70 with the lip and cheek tints retailing for £10 each. Any other magazine freebies that you have spotted recently? I predict another day of hunting down as many copies of Glamour as I can get my hands on. Such good freebies. Finally hunted down the Instyle magazine for the nail polish :) Glamour always does amazing freebies during the Spring/Summer! I've picked up the bluebell shade and am now on the lookout for the peach one! Is this everywhere it is sold or only where you live?? Love this post!! Cant wait for the Glamour mag!! Thank you for posting about this! I am going to try and get a few of the glamour magazines!